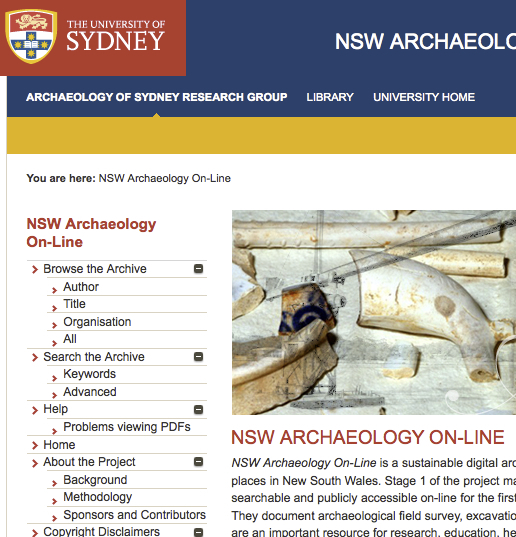 Yesterday, Agata Mrva-Montoya (@agatamontoya) at the University of Sydney forwarded me a wonderful resource for those who have an interest in accessing ‘grey literature’ resulting from archaeological work in New South Wales: the New South Wales Archaeology On-Line website that has been set up by the USyD library and the Archaeology of Sydney Research Group. “Grey Literature” are the unpublished material – typically reports – that are produced during research or heritage management work. These reports commonly include the original data or results of archaeological work and are an invaluable resource for research and management alike. Unfortunately though, it is often not possible to publish this material in its original form. It may be too detailed, of only local relevance or authors simply may not have had the time to convert it into a publishable form. As such, grey literature is usually only found in the personal archives of archaeologists, in the report libraries of Government Departments and so on. This is a problem because it means that not only is it difficult to access, but people may not even be aware of the existence of potentially important and useful work. This relatively new website that the good people at USyD have created is therefore a fantastic resource and quite frankly I think we need a lot more like it. It contains around 570 sources and seems that many of these have full text PDFs online. The Archaeology Data Service in the UK is a similar service and currently hosts about 8500 such reports, which I think illustrates the long term value associated with starting such an initiative. Pushing this material onto the web is more important now than ever before. The Australian Research Council’s ERA scheme has recently devalued the publication of data rich grey literature by creating a ranking system that primarily recognises high-impact outlets that are international in scope. What this means is that it is potentially damaging to put any effort into publishing data-rich papers in low-ranked journals or edited books that have traditionally been the outlets where grey literature are published. I suspect that we will see a decline in interest in publishing in such locations, which will not do anything to help liberate grey literature from obscurity and irrelevance. While not all grey literature can be made freely available due to confidentiality requirements, particularly where Aboriginal heritage is concerned, a national reports repository would be of great value to the discipline. As such, this resource is definitely worth making a note of, particularly if you work in New South Wales. My only concern is that the database does not seem to be in any web standard for bibliographic data (e.g COinS), but that’s a minor issue.